The Alcatel A382 is Tracfone’s second attempt at introducing a handset for seniors. They first introduced the Samsung T155g flip phone a while back, but it wasn't really designed for seniors. They also recently introduced the LG 440g which has a senior mode, but again that phone is not primarily designed for seniors. This one is. It has a large keyboard and a large screen with a simplified user interface and a good but limited set of features. One cool thing it has is an FM radio that doesn't require plugging in your earphones to operate. The keyboard consists of large separate rubberized keys with white lettering that is lit up with a backlight for ease of visibility. As a comparison, the phone and keypad is as wide as the LG 500g which features a QWERTY keyboard in the same amount of space by using smaller buttons! 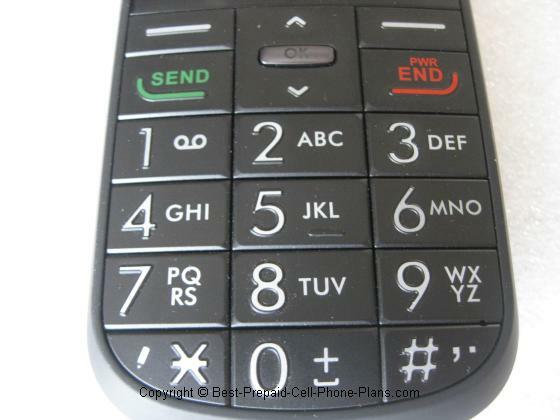 You use this keyboard for both dialing and text messaging. For messaging, you have both predictive texting (called “Smart”) and regular text input methods. This button is a little puzzling to me. As far as I can tell, pressing it merely causes the cell phone’s number to be displayed. It does not appear to be an emergency button, which is what I expected. The color screen is nice and bright and large enough to see everything clearly. The phone comes with a small set of eleven wallpapers to choose for your background, a couple of which are quite stunning pieces of scenery. Of course, once you choose it as your wallpaper, some parts of the scene are no longer visible. 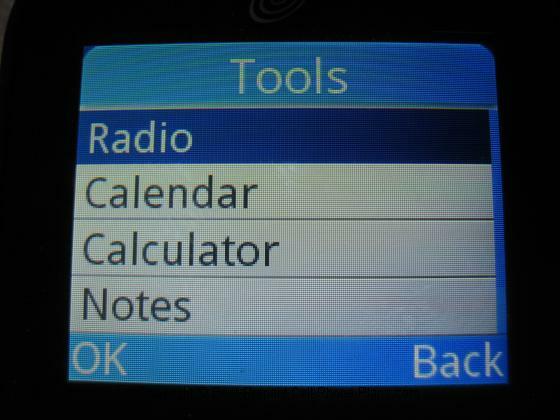 The user interface for this phone is different from the other Tracfones. The main mu items are listed along the right hand column, and the rest of the screen changes to indicate those choices. Overall, I would say this is easier to use than before. As mentioned above, this phone does a few things, but does it well. 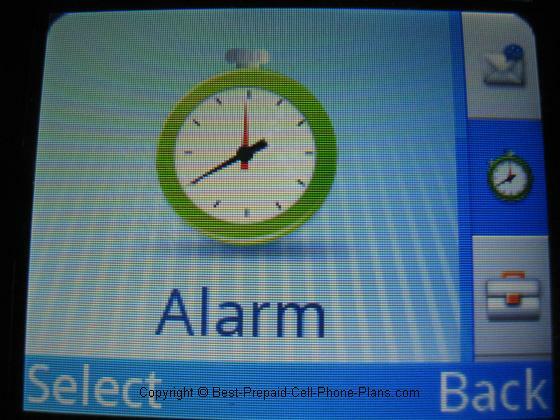 Along with calling and texting, you have access to a phonebook to store numbers, an alarm clock, calendar, calculator and FM radio. We'll take a look at some of these now. The one thing deliberately left out of this phone is web access. You can use your computer or tablet for that. The phonebook comes with two contacts pre-installed, 411 for information and 911 for emergencies. The 411 services cost you just the cost of your airtime and is free otherwise. However, the Tracfone 411 service does require you to listen to a brief advertisement at the beginning which is a little annoying because it’s costing you airtime. When I tried it, I got an ad for a dentist. The FM radio deserves a special mention because you can use it without having to use a set of earphones. Most phone with FM radios require you to use earphones, because they use the wires of the earphones to act as an antenna. The reception can often be a little wonky on those phones because the effective of the reception changes quite a bit with the positioning of those wires. On the A382, the FM radio antenna is built into the phone so you can use like one of those old “transistor radios”. Now there’s a blast from the past! Both the volume and quality of the sound on this phone is good. I made a call to the local library to ask about a petting zoo event. The librarian’s voice at the other end was easy to hear. I could tell both the characterisitics of her voice and what she was saying. You can choose from among 21 sounds for your ringtone and your message tones. You can also assign one of these ringtone to a particular contact in your phonebook, so you can recognize that they’re calling. 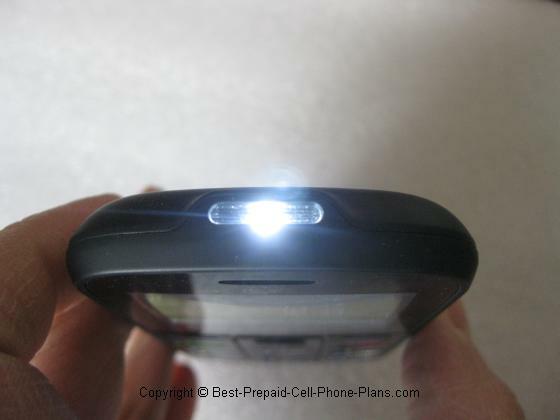 You can slide the top button on the right hand side to turn on the flashlight at the top of the phone. Surprisingly or not, this is one of the most popular uses of a cell phone for both convenience and safety. Finally, I have to mention the unlock feature because it’s both unusual and useful. You press and hold the lower button on the left side to unlock the phone. The lock feature prevent accidental dialing of number while carrying your phone. You can find the Alcatel A3832 documentation and interactive tutorial here. This is a well-designed easy to use cell phone. It doesn’t have the all the extra services you can get from a Greatcall Jitterbug flip phone or a handset from Consumer Cellular, but it is less expensive to operate if you don’t use the phone all that much. The package from Tracfone is notable for a charger stand for the phone - exclusive for this phone. You can get it direct from Tracfone with free shipping here. Tracfone seemed to finally get it right with this easy to use phone and make it a real competitor to what else is available. 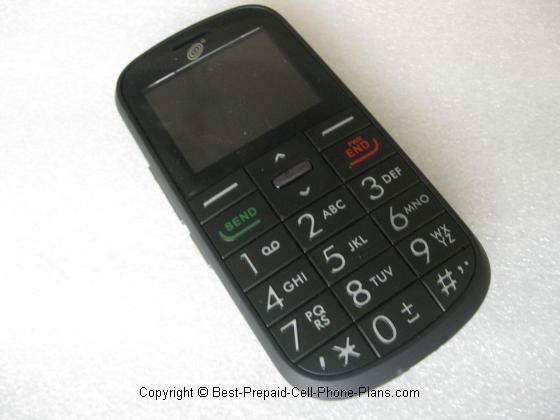 They also introduced a flip phone with a senior mode though it was not explicitly designated as an easy to use phone. However, if you're willing to pay a little more up front and each month, there are still some advantages to the other options. 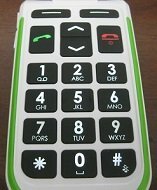 GreatCall introduced a new version of their flip phone called the Jitterbug Plus though some prefer the earlier model in Red. In addition to updating the flip phone, they also brought out and updated a smart phone, the Jitterbug Touch. All these handsets are compatible with the additional services and apps from GreatCall such as their Urgent Response service which includes Live Nursing advice. In the meantime, Consumer Cellular also offered an updated version of the Doro phone with large buttons. However they realize seniors and baby boomers have a wider range of needs. So they also offer regular inexpensive flip phones as well as a couple of nice smart phones. They also advertise the "convenience" of standard billing rather than having to use airtime refills.